Spit and see if I care. Spit! Mnemonics are tricks to aid in memorization. Birders use mnemonics to learn and remember bird sounds. Putting words to bird calls and songs makes them easier to recall. Some (most?) of them are quite funny. The White-eyed Vireo has one of my favorite bird song mnemonics. What do you think? Does this sound like expectoration encouragement to you? Spit and see if I care. Spit! Another mnemonic of this song is Quick, give me a rain check! (or, if you’re a Bill Bryson fan, Quick, give me a barf bag!). 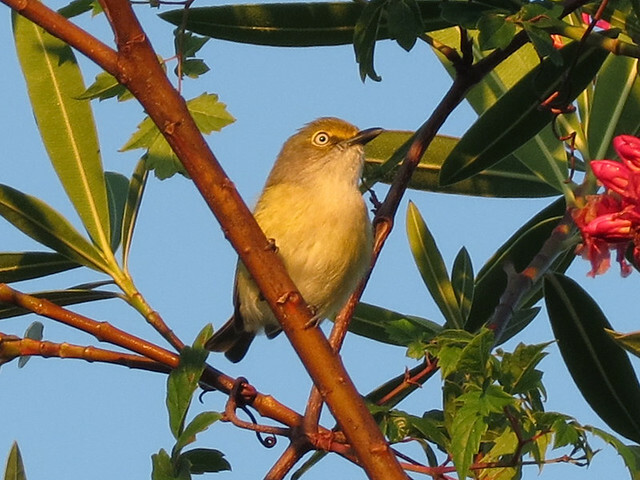 According to Florida’s Birds, White-eyed Vireos are “perpetual singers.” That seems about right to me. I hear them quite often in the neighborhood and at Gemini Springs. I found this one this morning on the way to birding at Gemini.